In lesson 10 join Mark and Kara for a seasonal special including greetings from our listeners from around the world and a Christmas song in Spanish. 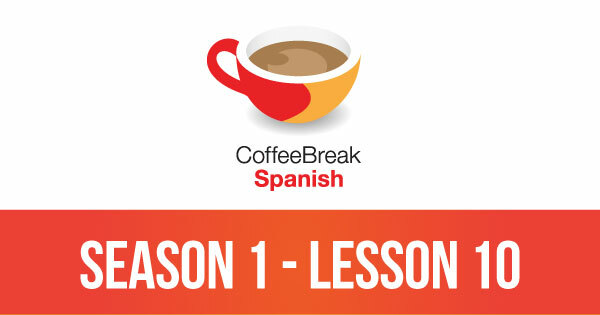 Please note that lesson 10 of Season 1 was originally known as lesson 110 of Coffee Break Spanish. We have renumbered the lessons of each season as lessons 1-40 to make things more simple for our listeners. Okay why are IRISH PEOPLE TRYING TO SPEAK SPANISH? THIS IS WRONG, OKAY? THIS IS WRONG! Seriously what the heck? Did you know that I am now SCARRED FOR LIFE? MY INNOCENCE IS GONE! IRISH PEOPLE WITH THICK IRISH ACCENTS DON’T SOUND LIKE SPANISH! FAKE IRISH SPANISH OMG NEVER AGAIN! DO YOU HEAR ME? NEVER. AGAIN!!!!!!!!!! Ay dios mio!! you need to learn common sense! Doesn’t matter where ur from lol. If u learn the proper pronounciation of any language u will be fluent. This is a good program. Que pasa contigo? scottish accents you narrow minded fool! Obviously never left your country! Excellent program. As an American, I find the instructor’s accent wonderful – and his Espanol is perfecto. They are Scottish actually, if you bothered to listen and find out…and they speak spanish very well. Why would having a Irish accent prevent a person from learning a language anyway? what accent do you have buddy? You are a very ignorant person and in the wrong place. Embrace other cultures, and accents and you might just succeed in learning a language, including your own!!! Scotish accent or not, you guys are the best! The lessons are VERY easy to follow. Not too fast paced that you miss everything and not too slow that you get bored with the lessons. @Marieq Thanks, we’re pleased you’re enjoying the lessons. I second your praise. I have only just descovered these shows and I am very happy I did. I wish they were videos and there was spanish subtitles included…that would be fantastic. But language is all about listening, so a radio broadcast is great and I just love it. Well done guys. Hi Mark, no need to defend yourself, except for maybe your Scottish accented English -hehe (I’m from the US). I also speak a number of languages, including Chinese, that I learned in school before living abroad for the past 30+ years. I speak them very fluently although I must accept the fact that I do not speak like a native. I can help other non-native speakers learn these languages including the accents because I have spent so much time figuring them out and practicing getting them right. Native speakers acquire their languages naturally and are not able to take apart how they speak to be able to teach someone else. Often native speakers will assume that my language level is better than it is because I can pronounce words and phrases so accurately. This was no easy task, especially with a tonal language like Chinese. So, thanks for putting these podcasts together, cheers! and press on. Oh, Mark I beg you, do not feed the trolls! to discuss about it at all. Well said! I love these podcasts–Irish accent and all! As an American, I have to say that I love the attempt at the flat American accent you and Kara did when you recorded this. And, thank god, we don’t all sound like that. Oh, and as to the comments about your “Irish accents”, I’m afraid that many of my countrymen aren’t even aware that there is a difference. I look forward each new, well new for me, lesson. And, one other thing, Me gusta cantar tambien, and enjoy the songs you share. love coffee break spanish! You are amazing, and I think a little too hard on your singing voice…it is perfect for my commute in Los Angeles and beats listening to the news. Thank you sooo much! Prosperos Anos Nuevos, Mark y Kara! A good Scot has a leg up on the rest of us in pronouncing Spanish, since those trrrrrrrrilled r’s come naturally! I am a friend of John Connell and Stuart Robertson. They directed me here and I’m enjoying your podcasts vey much. I’m from Taipei, Taiwan. A place far far away from Scotland. (But I’ve been to Glasgow, I love it!) Just want to show my appreciation for your efforts in this great Spanish lesson. It’s really helpful for the beginners and you make the learning a joyful process. You did a very good job and I’ll keep supporting Coffee Break Spanish. Mucho gracias!! Your lessons are great. I apologize for the narrow mindedness and lack of manners of my “AMI” “friend” Irisha. Your podcasts are among the best. There are many Spanish podcast, I use about 15 of them. Yours is a must. It is much easier to learn with yours. having previously worked as a language teacher (Irish and heard all the usual jibes!) and used a few different language series to teach myself, I am blown away by your series. Practical lessons, well structured, great progression and revision. The two of you are extremely likeable and your passion for the language and learning it is contagious (all too rare in most teaching). Keep up the good work! I can’t wait to work my way through Coffee Break and into ShowTime Spanish! I’m an American listener, and I have to admit that the Scottish brogue took some getting used to for me! But now I love it. I just about died from cuteness overload when Mark’s little son chimed in with his adorable accent (in lesson 6, I think). Hi everyone – I REALLY enjoyed learning Spanish 15 minutes a day…until we hit the heavy grammar lessons. I’m sorry, but I think it goes against everything that the program has been doing so well. It’s not possible to absorb complicated new grammar structures in 15 minute bites. The lessons lack context, are far too packed with nuances that can’t be absorbed at this early stage of learning, and simply confuse the beginning into getting caught up trying to think about what kind of verb we’re dealing. The lessons were WAY more effective when they were about learning little phrases and words that helped us get around. I look forward to the end of the grammar podcasts, and the resumption of the previous model. I appreciate the grammar. Words and phrases are fine for holidays and survival, but pretty soon you need to learn about the patterns of the language to get further. There is actually less to learn if you don’t have to try to remember each phrase or sentence in a vacuum. Being an american who used to live in Spain, I have to say I really enjoy learning with your podcasts. I lived in Madrid in ’97 and never really had practiced speaking spanish after I left. So I forgot a lot. Your podcasts are great. Keep up the great work. hi! Mark and Cara. I love our voices and accent, especially your tones. inspiration. Keep going on this. I’m looking forward to this podcast. este navidad cancion me encanter. mucho gracias! I don’t know if Mark and Cara are reading this website anymore, but if so, I want to say how much I enjoy Coffee Break Spanish. I discovered it in late July this year, and listen whenever I can. I started off with approximately 5 badly pronounced words, and now I’m practising at our local Mexican restaurant (and getting a lot of good natured laughs… they’re really helping me though!). I like the comparisons between languages, the background given, and the pace. Even when you go a little fast for me, I love that I can just listen again… and again… and again! Your Scottish accent makes it a complete pleasure to listen to. I agree with those who mention they can listen over and again. Your voice is so pleasing to the ear. And your Spanish is superb. Thank you so much for making it so easy to learn. I don’t normally comment, but I was so enraged by the comment at the top of the page that I felt I had to, even if it is two years later. I am an Australian who has been living in and out of Spain for the past 2.5 years and have independently learnt Spanish in a very random way. I have found that this course easily breaks down the language and has filled in the missing pieces I need to communicate more fluently. My native Spanish boyfriend and his family have been so impressed with the improvements that I have made thanks to your course. Just as in English there are many accents and versions, so too in Spanish. As I have lived in the mid to north of Spain, I have incredible trouble if I have to go to the south because of the change of accent. At the end of the day language is the most powerful means of communication and that is the point of this series – being able to communicate across borders. There is no one correct accent in any one language. I like learning from non-native speakers because you genuninely understand the problems that new learners can face. Plus your Scottish accent is awesome. If anyone wants to hear about language crusifictions, you don’t have to go further than hearing ignorant Americans (which is not to say all Americans are like this) attempting to speak Australian English. I really hope that the first commenter on this page has either a) moved on to another “more genuine” source of learning or b) left their homeland and had some real world experience that challenged their view. Either way, keep up the fantastic work of allowing more people a new source of communication! that one is fool we are enjoying. your lessons are sooooo helpful keep it moving! I just discovered these free podcasts and I am so excited to learn Spanish! I’m working in and all the languages I’ve learned at some stage (English, Latin, French, Russian, Italien, Romanian and now for roughly 1 1/2 years Spanish) I manage, nevertheless to progress eventually. I guess I share Mark’s (and probably a lot of the listeners’s) enthusiasm about languages and as many people confirmed, someone who has an understanding of foreigen languages/cultures easily appreciates your excellent skills. You should simply ignore rude comments as the one approx. two years ago. When I click on them , keeps taking me back to this website. Getting really frustrated with the whole thing !!!!!!?? I adore these podcasts. I am learning English like this. Before I listened to Coffeebreakfrench. Mark is very funny. And the girl is very nice. Love the Coffee Break Spanish! I am visiting Costa Rica, so really looking forward to practising my spanish. I especially love to hear Mark’s son Matthew…what a cutie. I just found this program today and I already love it! 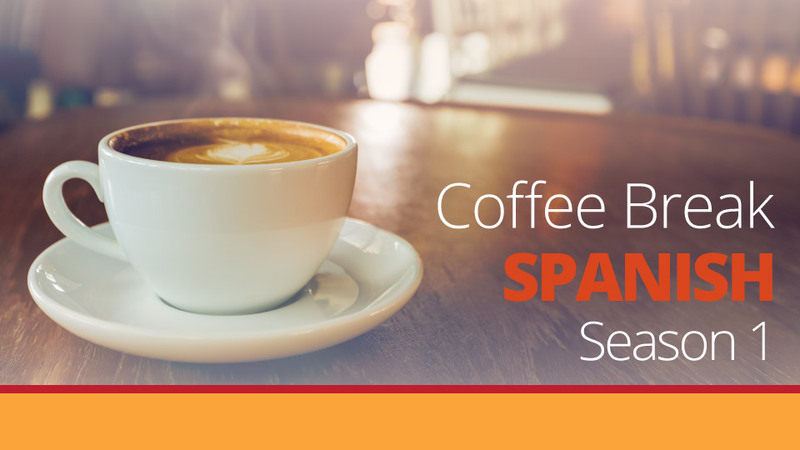 I would recommend Coffee Break Spanish to anyone and everyone . I’ve been so enlighted to hear your son as a special guest of you program! Excellent job! May I ask you a couple of questions? When have you started teaching him Spanish and how does your teaching process looks like? Gracias para ayudarme aprender Espanol (not sure about the grammar, still at the first season)))).